In a sheltered sunny valley in the Brenta Dolomites, the ski area of Madonna di Campiglio extends to include the neighbouring resorts of Folgarida and Marilleva with stunning scenery and challenging black runs. The scenery is awesome and the resort is built in attractive traditional style. The uncrowded slopes of Pinzolo, with stunning views of the Adamello glacier, can be reached by bus in 25 minutes. The resort is abounding with smart boutiques, lively bars, pizzerias and attractive cafés. Beginners are very well served and the ski school operate a free minibus service to the nursery slopes. Most runs are intermediate but not difficult, the main plan being to ski plenty of miles without too much challenge. There’s great variety, especially including the Folgarida and Marilleva extension, which is about half the system. Advanced skiers will enjoy the long, sweeping blacks from the top of Spinale and Pradalago back to the village. The lift system and pisting are absolutely first class and investment is continuous. Night skiing is available. 100% of the pistes are covered in snow making facilities which guarantees for skiing throughout the season. Very Italian with several lively bars. Don't miss hot chocolate at the Bar Suisse. The Stube bar offers a full selection of beers and the Cantina Suisse for good beer and live music until late. Many restaurants to suit all pockets including several excellent pizzerias and typical mountain restaurants. Le Roi for delicious pizzas and the Antico Focolare and Piccadilly Pizzeria are excellent restaurants. Don't miss the Spaghetti Haus for huge bowls of pasta. 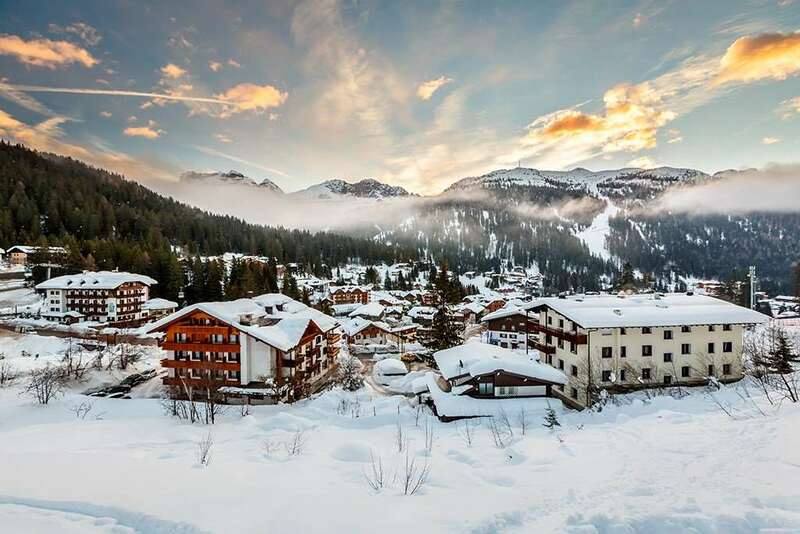 Bergamo (BGY), Brescia (VBS), Venice (VCE) and Verona (VRN) are the nearest airports to Madonna di Campiglio which are all within a three hours transfer of resort. Simply the best all round family ski resort for skiers and snow boarders alike. Rifugios are welcoming and serve great food at reasonable prices.Beautiful views and linked to 2 other resorts via lifts. Hotels are all modern and chic with Lorenzetti and Des Alpes the best. Hotel laura in the centre is real gem having had a really great update. Chic and classy is the sum up and 35 yrs skiing this resort is a credit to the town. Ferrari & Ducati can`t be wrong having had their annual week skiing here for 22yrs.Valentino Rossi has a place here and is seen on the slopes snowboarding...... though disguised he loves it when he`s spotted !! Must be best resort in Italy. Chic and hidden away, a real jewel in the Western Dolomites. Great food at Genziana Refugio up Pradalago Mountain get in before 12-15 though and try the Piastra Meal you cook yourself on hot stone at your table Delicious!!! Its my 30th year skiing and snowboarding here and I won,t dream of anywhere else A MUST for all skiers.